Setting the Month of October off on the right note – 100 BAND NEEK has released the wild & vibrant new-single “Diamond Talk” to bring that True Flow into speakers & stereo-systems all over the globe. Combining a dynamic electro-melody with a smooth, focused vocal-flow – “Diamond Talk” brings the party straight to YOU, the people; and with its supercharged hooks, Life Wild Vibes and relentless enthusiasm, this is one Track you’ll never want to end! 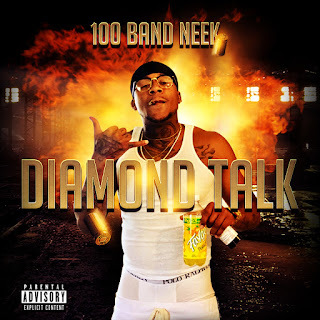 Set & ready to make all kinds of big moves throughout the End of 2018 and the new year of 2019, “Diamond Talk” is the lead-single from the upcoming releases of 100 Band Neek coming out this year and 2019. Determined to make his mark, 100 BAND NEEK puts 100% of himself into the recording sessions in effort to create music that truly makes a memorable impact & popped like it was in 3D – “Diamond Talk” is a perfect example of how the pure sound, melody and flow of his style becomes complete entertainment you can seriously feel flow right through you. Designed for the good-times to keep-on rolling, “Diamond Talk” a HOT New Track that the world can enjoy; one that it needs right now to remind us all just how good those good-times can truly be. Turn up “Diamond Talk” and pop a bottle or two in celebration wit’ yo boy 100 BAND NEEK – it’s going to be one hell of a year…and now that the party has officially started, there’s no stopping it…or him.